Tina Welling's "Cowboys Never Cry"
Today’s post is from Tina Welling, author of Fairy Tale Blues, Crybaby Ranch, and Cowboys Never Cry. I met Tina via email when I wrote to tell her how much I enjoyed Cowboys Never Cry. She graciously offered to do a guest post and I was delighted to accept. 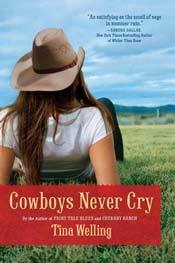 Not only that, she’s giving away a signed copy of Cowboys Don’t Cry to a lucky reader who comments on her post. So, please be sure to tell us what you think! For more information on Tina, visit her website at www.tinawelling.com. Life is a good news/bad news situation. The bad news is that we are all going to die someday (I’m sorry to just blurt that out like that). The good news is that we get to live until we do. While I was writing my novel COWBOYS NEVER CRY, I became aware that writers need to live more fully than their readers. We must be exquisitely aware of ourselves and our surroundings and the life force that throbs within us in order to evoke that in readers. Some writers in the past have thought that living fully meant drinking a lot, eating exotic foods, having many lovers, traveling to foreign places, and putting themselves in life-threatening danger. A full life, as many viewed it, was found at the extremes. I think of Ernest Hemingway running with the bulls, deep sea fishing, big game hunting, and then returning home to use the material for his writing. These activities appeared to be living life to the hilt to readers who were struggling through a world war or the Depression that followed. Limited choices described the daily lives of most people during those times. Now most everyone can experience drinking a lot, eating exotic foods, having many lovers, traveling to foreign places, and life-threatening danger is as close as the nearest expressway. I live in Jackson Hole, Wyoming where much of the population enjoys outdoor adventures on a daily basis – extreme skiing, mountain climbing, backcountry hiking. My hometown audience gets their reading adventures by just picking up the newspaper. I thought about this as I wrote COWBOYS NEVER CRY and I decided that readers still desire to have their novels be about experiences that are not easily accessible to them, yet that desire has changed from a broader experience of life to a deeper experience of life. My goal was to incorporate that idea in COWBOYS NEVER CRY. While writing with humor – because everything is more fun when you’re laughing – I also told a story of people’s lives that held an intensity and fullness and intimacy uncommon to many of us. But a writer can’t fake that anymore than Hemingway could fake running with the bulls. A writer must experience the wild edges of aliveness in order to write about them with vivid truth. Once, in writing about the stars overhead, a writer could express knowledge about their configurations and the myths and legends behind them to reach deeply into their reader. Now as a writer, I need to know the stars in my body, feel them burn my skin, sense their light pinning me to the planet. If I can do that, the vibrancy and authenticity that only come from true experience will ignite those same feelings in the reader. So if life is a good news/bad news situation, both reading and writing can lead to more of the good news, experiencing life more fully. This entry was posted in Uncategorized and tagged Cowboys Never Cry, Crybaby Ranch, Fairy Tale Blues, Guest glob, Reading, Tina Welling, Writing life. Bookmark the permalink. Don’t forget to leave a comment to win a copy of Tina’s newest book, “Cowboys Never Cry.” I really enjoyed it, and I’m sure you will too. Just yesterday I was listening to book by a popular favorite author, and I got to thinking that, while sometimes his story is less than impressive, his writing always is. I marvel at a turn of phrase, or something described make me think-shout “That’s exactly how I saw it”, “it” being something I could never describe to anyone else. As a reader, I depend on my authors to articulate for me some of the experiences I’ve enjoyed or endured, as great or small as they may be. Thank you for taking the time in your stories to express feelings that I can never accurately describe myself, even to myself. What a nice articulation of how I feel myself with some writing. There was a phrase in one of Tina’s books that described conversation with a certain person as being like “playing catch with someone who keeps the ball.” I just loved that description — the words captured the idea perfectly. Sorry to be so dumb, but I’m confused. Tina, are you saying that for a writer to express her characters’ feelings authentically, she must first experience them herself? BTW, I was very impressed with COWBOYS NEVER CRY and wondered what’s up next – will you continue with the world and characters you created for that story, or do you have plans for something entirely different? Thanks for the comment, Lee. I’ll leave your question for Tina to answer. Hi Lee, As a writer, I don’t need to experience every event and human emotion in order to write about it, yet I do need to energize my imagination by living fully, with a deep awareness of life around me and hold an active sense of compassion for the entire range of human feelings. Listening, pay attention, caring and responding is the key for me. My next writing project may be a more intense exploration of these ideas. I haven’t decided for sure, but it interests me quite a lot to examine creative energy and de-mystify it for myself and others. Thanks for responding, Lee. Tina, your book sounds wonderful! “The wild edges of aliveness”–I love that! It reminds me of something I once heard, that fiction is not an exact replica of life–it is BIGGER than life–more intense, more quickly dramatic. Thanks, Kym, for a great book recommendation! And thank you, Mary Jane, for your comment! Thank you, Mary Jane. I recently came across a quote that I jotted down on a ragged piece of note paper long ago. I haven’t been able to confirm it so far, but my note says it’s from the French author Stendahl. “A novel is like a violin and the bow is the soul of the reader.” I like that so much, because it describes the relationship between reader and writer and gives it the honor it deserves. I will definitely be looking for your books on my next trip to the bookstore. I love what you said, “the vibrancy and authenticity that only come from true experience will ignite those same feelings in the reader.” I hadn’t ever thought of it that way, but I will from now on. Thanks for the nice comment, Diane. I appreciate your stopping by and know Tina does too. That is so nice to hear, Diane. Thank you. tina’s way of living life to the fullest works. but hemmingway was so pleased with his version that he killed himself. a natural death for those who emulate his form of fullness. it’s sad that so many still try to gain it in such a hollow way.